Dominion architect Thomas Fuller devised the architectural design of Government House. Born and educated in England, Fuller arrived in Canada at the age of 34. Inspired and influenced by the very popular High Victorian Gothic architectural designs during the mid and late nineteenth century, he and his partners had been selected to design a number of prestigious projects, including the Parliament Buildings, and the Governor General's residence (Rideau Hall) in Ottawa, and the New York state legislative buildings in Albany. By the late 1880's the ornamental exuberance of the Gothic style had lost its popularity, and there emerged a general shift towards simpler and less ornate examples of architectural design. Government House is a reflection of Fullers' appreciation of this transformation. Thus the house as it was constructed did not represent any one school of architectural style, but rather can be seen as a compilation of several different techniques. Perhaps more than any other the structure reflected an adaptation of the Italianate design. Italianate architectural design emerged during revival of the Gothic Architectural style during the mid-nineteenth century. This phenomenon developed as a rebellion against the restrictive formality of earlier classical ideals. This new style used rambling, informal Italian farmhouses as models. More than any other architectural style, Government House was designed in this Italianate style. Typical of the design, the House boasts a squared dome centred on its peak. Its windows are of a Roman arch design and of a segmented arch variation. and approved by architect Thomas Fuller in July, 1888. Construction on the new Vice-Regal residence began in the spring of 1889. Local contractor William Henderson was awarded the project and construction began on the new residence in the spring of 1889 on fifty-three acres. bedrooms were 55 feet by 42 feet. In the basement, space was to be provided for a furnace, storage areas, and space for tanks for rain and well water. 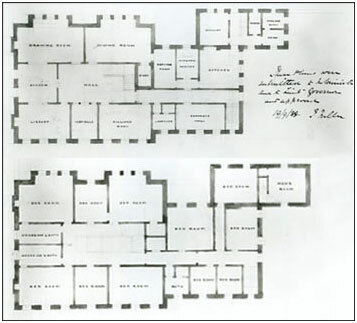 The ground floor consisted of a lobby or reception area, a vestibule and a main hall, a staircase, two drawing rooms, dining room, library, billiard room, kitchen, housekeeper's room, servant's hall, scullery, dairy storage, cooling room, storeroom, china pantry, wine vault, brick safe and a lavatory. On the first floor there were to be 15 bedrooms, 2 dressing rooms with bath, a bathroom and a water closet.